WASHINGTON (AllPolitics, April 15) -- While NATO continues to strike targets in Yugoslavia, many on Capitol Hill are wondering what the U.S. portion of the military action will truly cost. On Thursday, the Congressional Budget Office reported the conflict had cost the U.S. roughly $600 million in the first three weeks and if sustained the airstrikes could run over $1 billion each month. But those estimates do not include humanitarian aid, or certain procurement costs -- such as replacing the downed F117 "stealth" fighter -- that surely will be included in President Bill Clinton's still unfinished emergency supplemental spending request. Although there is no question Congress will pay to support American servicemen overseas, for now, money is not the object but a means to an end. Congress will use the purse string to pull some answers out of the White House. In short, the president will get the money he needs, but no free ride. "He needs to give us first of all the estimate of what that cost is going to be, why we are there, when we are going to get out and what are the situations or objectives that allow to get out of there," House Speaker Dennis Hastert (R-Illinois) said Wednesday. On Thursday morning, Secretary of State Madeleine Albright appeared before a House Appropriations subcommittee to discuss funding for her department in the next fiscal year. But she could not escape Kosovo. House Appropriations Committee Chairman C.W. Bill Young (R-Florida) warned that America's military is "stretched very thin" and he hopes the administration will do more than "just replace the bullets and the missiles" used in the Kosovo conflict. 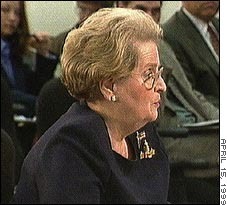 Applying pressure for presidential support for the Republican plan to increase defense spending, Young told Albright he hopes the emergency supplemental appropriations request for Kosovo recognizes "that there is a serious stretching very thin of our overall capability and hopefully supports us in our effort to try to get the military back to where it should be. "We need to start the process quickly on the dollar numbers," Young said. "The number that I am reading in the newspapers, in my opinion will be totally inadequate to carry even the Balkans issue to the end of the fiscal year." While projections have placed the estimated cost at $3-5 billion, Albright did not have the hard numbers Young was looking for, bringing with her only a plea for the emergency spending. "If ever there were an emergency, Mr. Chairman, this is one" she said. "We are confronting an outrage we cannot accept and only we and our allies have the muscle to oppose." On Thursday afternoon Young, Senate Appropriations Committee Chairman Ted Stevens (R-Alaska) and other congressional leaders met with White House budget director Jack Lew to discuss the administration's request, but no final figures were announced. "We're very close," Lew told reporters after the session. Cost estimates are often difficult to come by and they are even harder to stick to. "I am learning that all numbers rise, so I think there is a good chance it will be more than four billion," Pentagon Spokesman Ken Bacon says. "Everyday we delay in sending it up it rises." War is not cheap. A single tomahawk missile is about a $1 million. A laser guided bomb estimated at around $50,000, some planes cost $5,000 dollars an hour to fly. Estimates placed around $4 billion may not seem enough to some skeptical congressional leaders, but many analysts say it may suffice for the time being. "Four billion dollars, if we just continue with the air campaign at its current pace and it lasts a matter of several months perhaps at most, that may be enough money," Stephen Kosiak of the Center for Strategic and Budgetary Assessments says. "But again, if it goes to a ground war where we're really forcibly trying to push the Serbs out of Kosovo, it could be much more costly." Experts figure a ground war could push the tab into the $10 billion range. CBO Director Dan Crippen said that sending in ground troops could cost another $200 million a month, assuming a force of about 27,000 troops. But with ground troops not being discussed by the administration, congressional officials close to the process say they expected the administration will request at least $5 billion. Whatever the final cost, it appears likely that Congress will agree to take it out of this year's budget surplus. Correction: Quotes attributed to Rep. Harold Rogers (R-Kentucky) in an earlier version of this story were actually comments by Rep. C.W. Bill Young (R-Florida). CNN's Candy Crowley contributed to this report.